According to the International Data Corporation (IDC) Worldwide Quarterly Mobile Phone Tracker, the Android platform just crossed 80% marketshare in the third quarter of 2013. With 211.6 million smartphones shipped in this quarter, Android continues to maintain its dominant position in the market, this time reaching an all time high with a 51.3% growth over last year. 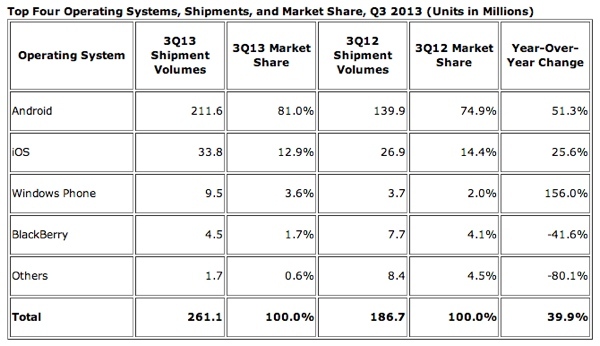 Samsung singlehandedly contributed to almost 40% of the total shipments this quarter. Android is not the only platform doing well. Although not quite there yet in terms of total marketshare, Microsoft's Windows Phone platform grew by 156% year-over-year, reaching 3.6% marketshare in the third quarter in terms of shipment. Nokia alone contributed to 93.2% of the total shipments. iOS also continued it's slower but continued growth, with a 12.9% marketshare that is 25.6% over last year. One thing to remember that these numbers only take into account shipments and not actual devices sold or actually being used, which could paint a different picture. this is matter of pricing . Android phones sell because of lower price than iphone. if android phone should have a same avarage price as iphone , people will buy more iphones.